Antonio Brown (DK – $9,100/FD – $9,000): Fantasy owners are still waiting for Brown to deliver an impact game. On the year, he’s averaging over 13 targets per game while scoring three TDs. Antonio doesn’t have over 100 yards receiving in any game with only three catches over 20 yards, which puts him on a pace for 12 on the year. Last year Brown had 27 catches over 20 yards in 14 games. WRs have 58 catches for 681 yards and seven TDs on 82 targets against the Falcons with two players gaining over 100 yards (Michael Thomas – 10/129 and Tyler Boyd – 11/100). Atlanta’s CBs will have their hand full in this game on the road leading to Brown producing his best game of the year. His salary is top shelf, which requires almost two TDs and over 100 yards receiving his salary bucket. Julio Jones (DK – $8,500/FD – $8,800): After four games, Jones is the ranked 8th in WR scoring in PPR leagues with two strong games in yards and catches (10/169 and 9/173). Julio is on pace for 2,008 yards, but he doesn’t have a TD on the year despite averaging 17.3 yards per catch. His catch rate (63.0) is slightly ahead of last year’s pace (59.4). Jones averages 11.5 targets per game with most of his chances coming in Week 1 (19). Pittsburgh struggled with WRs in each of their last three games (14/210/3, 17/278/2, and 14/234/1) with four WRs gaining over 100 yards (Jarvis Landry – 7/106, Sammy Watkins – 6/100, Mike Evans – 6/137/1, and Jones Brown – 3/116/1) on the year. Great matchup, but the Falcons need to find a way to get him involved in the TD department. Keenan Allen (DK – $7,800/FD – $6,500): Allen has been a boring ride over his last three games (6/67, 3/44, and 7/63), which almost screams impact game in Week 5. His best success came on opening day against the Chiefs at home (8/108/1). In 2017, Keenan had six of his seven games with over 100 yards receiving games at home along with five of his six TDs. Last year he beat the Raiders for nine catches for 133 yards and one TD on 12 targets at home. WRs have 47 catches for 761 yards and six TDs on 89 targets against Oakland. No receiver has over five catches or gained over 100 yards vs. the Raiders in 2018. Allen is the 31st WR after four weeks, which suggest a correction game is on the way. His downside may come if LA has success on the ground. He looks likes an against the grain play with a favorable salary, but I see nothing but green lights in his matchup. 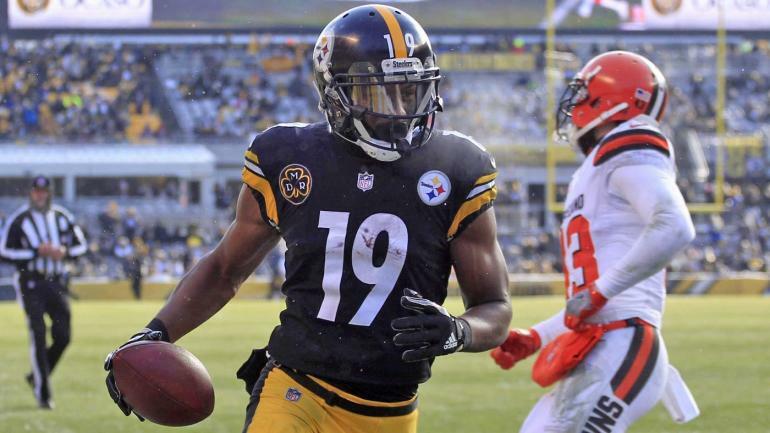 JuJu Smith-Schuster (DK – $7,500/FD – $8,000): Smith-Schuster saw his streak of 100+ yards receiving end last week at home when the Ravens held him to four catches for 60 yards on 11 targets. JuJu has three strong games (5/119, 13/121/1, and 9/116) already in 2018 while averaging over 12 targets per game. CB Brian Poole lines up in the slot on most plays for the Falcons. He tends to allow a high catch rate while keeping his defender in front of him. Smith-Schuster will catch plenty of balls with a TD being a reasonable outcome in this shootout game. In the mix for sure at this level. 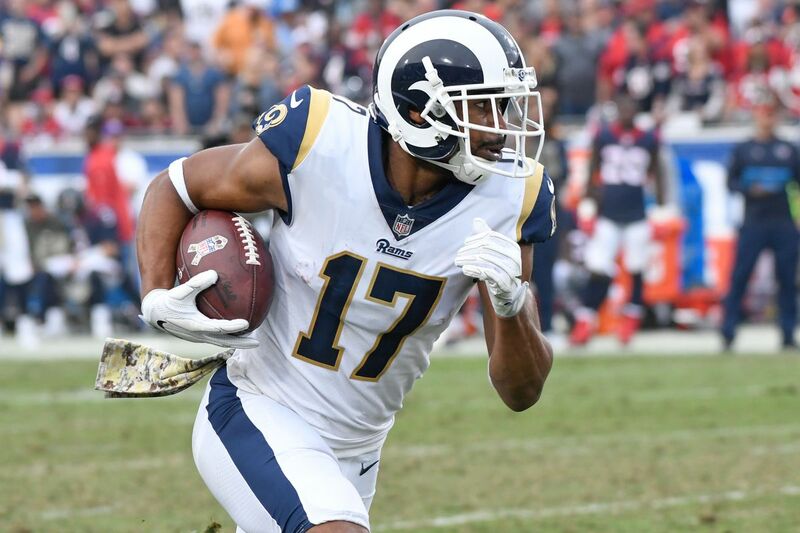 Golden Tate (DK – $6,700/FD – $7,400): Tate went from possible game-time scratch to the second best WR on the week when he caught all eight of his targets for 132 yards and two TDs. Over four games, Golden has 28 catches for 389 yards and three TDs on 44 targets with two other games with over 20 Fantasy points (7/79/1 and 7/109) in DraftKings scoring. Last year he caught 14 passes for 217 yards and one TD on 16 targets in two games against the Packers. WRs have 46 catches for 547 yards and six TDs on 74 targets with the Vikings’ WRs (23/282/4) doing most of the damage. Both Adam Thielen (12/131/1) and Stefon Diggs (9/128/2) had big games. Rookie CB Jaire Alexander played well in three of his four games, but he had no answer defending Minnesota’s slot WR in Week 2. Tate should be active again this week while owning a nice resume in this matchup. Tyler Boyd (DK – $5,700/FD – $6,300): Boyd is going to go down as the big free agent WR pick in 2018. Over the last three games, Tyler has 23 catches for 323 yards and two TDs on 31 targets leading to three straight strong games (6/91/1, 6/132/1, and 11/100). CB Bobby McCain will give up big plays out of the slot giving Boyd another favorable matchup. His salary does matchup his recent opportunity (10.3 targets per game) while offering big play and scoring ability. Marvin Jones (DK – $4,700/FD – $6,500): Jones has yet to deliver an impact game in 2018. He has 15 catches for 223 yards and two TDs on 29 yards with his best game coming in Week 3 (4/69/1). Last year he had one big game against the Packers (7/107/2) and success in his other game at home (4/81/1) while receiving 16 combined targets. The previous season Marvin beat Green Bay for 205 yards and two TDs on six catches on the road. Jones should have an edge against CB Tramon Williams on about half of his plays. Great resume in this matchup, which gives him a chance at an explosive game. Mohamed Sanu (DK – $4,200/FD – $5,600): After three short games, Sanu posted his best game of the year in Week 4 (6/111 on nine targets). Over four games, Mohamed has 16 catches for 184 yards and one TD on 24 targets while still getting WR2 snaps for the Falcons. Pittsburgh has had huge problems at the right CB slot, which gives the WR on that side of the field to have a productive game. Viable backend filler. DeAndre Hopkins (DK – $8,200/FD – $8,700): Hopkins has double-digit targets in each game in 2018 with a floor of six catches each week. He’s on pace for 120 catches for 1,772 yards and eight TDs on 176 targets. DeAndre has two impact games (6/110/1 and 10/169/1). Dallas has a very good pass rush (14 sacks), which is a problem for Houston (17 sacks allowed). The Cowboys played well vs. WRs over the first three games (7/79, 10/116, and 8/132/2), but the Lions showed that Dallas could be beaten in their secondary in Week 4 (15/262/2 on 18 targets). Golden Tate (8/132/2) is the only WR with over four catches and 100 receiving yards. Not the best matchup and a lower scoring battle does limit his impact value especially with CB Byron Jones playing well in 2018. Houston will move Hopkins around to get more favorable matchups. Devante Adams (DK – $7,600/FD – $8,000): Adams has been more steady than explosive in 2018 due to short yards per catch (10.2) and only two catches over 20 yards. He’s scored a TD in three games while setting a nice floor with seven catches or more in his last three starts. Davante is one pace for 112 catches for 1,140 yards and 12 TDs on 172 targets. Last year he had seven catches for 53 yards on ten targets against the Lions. WRs have only 29 catches for 420 yards and three TDs on 47 targets in four games vs. the Lions. Game score led to short passing chance in Week 1 against the Jets. Detroit controlled the clock in Week 3 vs. the Patriots. In their other two games, the Lions faced two teams (SF and DAL) with weak wide receiving options. Green Bay has injuries at WR, which will make it tougher for Aaron Rodgers to make plays in the passing game. Fade for me based on matchup, but he may see a bump in chances by default. Robert Woods (DK – $6,500/FD – $7,200): Woods has back-to-back strong games (10/104/2 and 5/101/1). Over this stretch, he caught 15 of his 16 targets. On the year, Robert has 24 catches for 323 yards and three TDs on 34 targets. All of the Rams’ WRs are on pace for 1,000+ yards, which is a higher opportunity than I expected for Wood. Last year he caught 11 passes for 111 yards and one TD on 15 targets in two games against the Seahawks. He should draw Seattle’s top CB Shaquill Griffin on most plays, which would temper my expectations on the road. Demaryius Thomas (DK – $5,600/FD – $6,700): Demaryius struggled to make plays in each of his last three starts (5/18, 5/63, and 4/24) while receiving 23 targets. Last week Case Keenum missed him in the last minute of the game, which would have delivered the winning TD. Thomas is gaining only 8.4 yards per catch. Coming into the year, Demaryius looked poised for a rebound year, but his game and QB play suggests minimal explosiveness. The Jets don’t have a shutdown corner, but I can’t trust that Keenum can make scoring plays in the red zone. Sterling Shepard (DK – $5,600/FD – $6,200): Shepard made me look good in his last two starts (6/80/1 and 10/77/1) while receiving 17 targets over this stretch. On the year, Sterling has 24 catches for 229 yards and two TDs on 29 targets. This week I expect mid-level targets, but a TD will be harder to come by while facing a team that likes to keep WRs in front of them in coverage. The fun ride takes a back seats after seeing his salary raise to an unfavorable area. Kenny Stills (DK – $5,400/FD – $6,300): Miami has only attempted 100 passes in four games, which has led to much shorter targets for Stills and the Miami receiving core. Over four games, Kenny has 12 catches for 224 yards and three TDs on 19 targets. WRs have 63 catches for 792 yards and five TDs on 100 targets against the Bengals. CB Dre Kirkpatrick will keep WRs to a shot catch rate, but he can beat for a long TD. Seems overpriced for his 2018 success and low volume opportunity, but Cinci should score leading to the Dolphins needing to pass to win. More of an opposite piece of Bengals’ stack. Quincy Enunwa (DK – $5,200/FD – $6,100): Enunwa at least delivered a steady game (4/66 on eight targets) in Week 4 against the tough Jaguars’ pass defense. Over four games, Quincy has 21 catches for 278 yards and one TD on 37 targets. He did land in the injury report this week with a hip issue, which puts him at risk to play on Sunday. WRs have 57 catches for 630 yards and three TDs on 82 targets against the Broncos with one WR gaining over 100 yards (Amari Cooper – 10/116). Lower tier matchup question upside in scoring. Jordy Nelson (DK – $4,500/FD – $5,600): Nelson didn’t make any big plays last week, but he did score a TD to help deliver a steady game (5/48/1) for the season-long contests. Over his last two starts. Jordy has 11 catches for 221 yards and three TDs on 16 targets after being one shovel way from his Fantasy grave over the first two games (3/23 and 2/30). The Chargers do have a very good CB in Trevor Williams who has worked mostly out of the slot this year. Interesting matchup where experience meets youth. On the positive side for Nelson, Williams played much better in 2017. Robby Anderson (DK – $3,800/FD – $4,900): Anderson only has eight catches for 108 yards and one TD on 16 targets with his only scoring play coming in Week 1 (41-yard TD). Last week he was out-snapped by Jermaine Kearse (85 to 75). CB Bradley Roby is one of the better CBs in the league, which make Anderson and against the grain play. Tyreek Hill (DK – $6,900/FD – $7,800): Last week Hill had a season-high 13 targets, but he only gained 54 yards on his nine catches. On the year, Tyreek has 23 catches for 364 yards and four TDs on 32 targets. He has eight catches over 20 yards with two gaining over 40 yards. WRs have 43 catches for 444 yards and two TDs on 72 targets against the Jaguars with one WR gaining over 100 yards (Odell Beckham – 11/111). Tough to trust in this matchup against a top pass defense. Antonio Callaway (DK – $4,400/FD – $5,200): Callaway had plenty of chances in the last two games (20 targets), but he only caught seven of his chances for 74 yards. His game looked to offer upside in Week 2 (3/81/1 on four targets). His low catch rate (40) points to a drop back in chances and possible loss of playing time. Antonio has the talent to get open, but he struggled to win jump balls or contested passes. Tough to trust vs. a good Ravens’ defense. Sammy Watkins (DK – $4,800/FD – $6,400): After leaving last week’s game with a hamstring injury, I gave Watkins no projections for Week 5. He did turn in a limited practice on Wednesday giving him a slight chance to suit up this week. Even if he plays, Sammy has a tough matchup. Over the first three games, he caught 14 of his 20 targets for 176 yards and one TD. It’s tough enough winning in Fantasy sports with healthy players. I see no reason to play Watkins in the daily games. Marquise Goodwin (DK – $4.500/FD – $5,500): Over the last two games, Goodwin has five catches for 54 yards and one TD on eight targets while being on the field for 62 percent of the 49ers plays in each game. He’s back on the injury report with hamstring and quad issues. Pure avoid until he shows he can play a higher percentage of snaps and more explosiveness in his game. Keke Coutee (DK – $4,200/FD – $5,400): Coutee came off the bench to last week to fill the void created by the injured Will Fuller. He looked like the same type of player while posting a great game (11/109 on 15 targets). Most of his success came on crossing routes. In the high-stakes market, Keke went for big dollars which is going to be a mistake based on my preseason research. Here’s my May write up on him: In his junior season at Texas Tech, Coutee exploded for 93 catches for 1,429 yards and ten TDs. Over his previous two years, he had 66 combined catches for 995 yards and seven TDs. Keke is a pure deep threat at this point in his career with some potential in the return game. Coutee lacks size (5’10” and 180 lbs.) coming into the NFL while needing to add more strength. His route running is a liability, and he lacks the toughness to win battles off the line of scrimmage against physical receivers. Game tape will lead to Keke being slow down at the line of scrimmage while still having an underlying hamstring issue. With Will Fuller expected to this week, Coutee will be a weaker ride in the daily games. Odell Beckham (DK – $8,000/FD – $8,300): Beckham has plenty of targets (45) on the year, but New York can’t figure out how to get him more involved in the deep passing game. Odell averages 10.7 yards per catches while still looking for his first TD on the year. His best success came in Week 1 (11/111) and Week 2 (9/109). Over the first three games, WRs have 40 catches for 530 yards and two TDs on 61 targets against Carolina. Tyler Boyd (6/132/1) is the only WR with success vs. the Panthers in 2018. CB James Bradberry is off to a better start this year, but he can have risk in the deep passing game. Tough to trust until New York blocks better on the offensive line and opens up the playbook, which paints Beckham as lower percentage play in Week 5. Adam Thielen (DK – $7,700/FD – $8,300): Thielen has developed into a great WR. He gets open and catches most of the balls thrown his way (71.4 percent in 2018). Adam has over 100 yards receiving in each game and double-digit targets. He’s on a pace for 160 catches for 1,896 yards and eight TDs on 224 targets, which is well above the best season at WR in NFL history as far as catches and opportunity. Philly already has two bad games defending WRs (TB – 20/276/3 and TEN – 19/271/2), which invites upside for the Vikings’ WRs. Minnesota can’t run the ball, and the Eagles tend to shut down the run game. This combination will either lead to more punts than expected or a wide open game in the passing game. Tough to double down on a winning ticket from week-to-week in the daily games, but Thielen continues to get it done on the field. Brandin Cooks (DK – $7,400/FD – $7,800): Cooks has been a great fit in the Rams’ offense after four games. He’s caught seven passes in each of his last three games with an exceptional catch rate (84). Brandin is on pace for 36 catches over 20 yards, which more than double his best success in the NFL. Cooks is projected to earn 104 catches for 1,808 yards and four TDs on 132 targets. Seattle showed risk defending WRs in Week 1 (DEN – 18/243/2) with improvement with each game played (17/130/1, 11/110/1, and 9/82/1) while facing three straight weak passing teams (CHI, DAL, and ARI). All three Rams’ WRs will have an edge in this matchup. Cooks is the highest price Rams’ WR with possibly the lowest upside in TDs in the red zone. Based salary and targets per game (8.25), I’ll fade on the road even with a favorable WR/CB matchup. A.J. Green (DK – $7,200/FD – $8,500): Green has almost the identical path in targets (8, 9, 8, and 8) as Brandin Cooks, but he’s gained much fewer yards (297) with short catches (20) while showing more scoring ability (five TDs). A.J. hasn’t gained over 100 yards despite gaining 14.9 yards per catch. The emergence of Tyler Boyd has hurt his targets in many games while facing double coverage on most plays. WRs have 44 catches for 678 yards and three TDs on 77 targets against Miami with Jordy Nelson (6/173/1) having the only impact game at WR. CB Xavien Howard played well in coverage over the first three games, but New England saw enough flaws to beat him for a pair of TDs last week. Green is an elite player who can’t beat any defender with one-on-one coverage. It’s almost like it’s his turn for an impact game at WR in Cinci. Whenever I go to bat for A.J., he leaves me with empty pockets in the daily games. Emmanuel Sanders (DK – $7,100/FD – $6,700): Sanders continues to be the best WR in Denver even with two straight short outings (5/38 and 5/45 while gaining 53 combined yards on two rushes). Over his last three games, Emmanuel only has 19 targets. He shined in Week 1 vs. the Seahawks (10/135/1 on 11 targets). WRs have 62 catches for 781 yards and three TDs on 104 targets against the Jets with two teams having a high level of success (DET – 19/253/1 and JAC – 17/260/1). Four WRs have over 100 yards receiving against New York (Kenny Golladay – 7/114, Jarvis Landry – 8/103, Dede Westbrook – 9/130, and Donte Moncrief – 5/109/1). His salary is high for his opportunity plus Case Keenum hasn’t thrown a TD in three games. More reasons to avoid than to take him to the daily dance, but he does have a much more favorable salary at Fanduel. Stefon Diggs (DK – $7,000/FD – $8,200): Game score led to Diggs receiving 38 targets over his last three games leading to two nice games (9/128/2 and 11/123). He struggled to get open against the Bills (4/17 on ten targets) with only a steady game in Week 1 (3/43/1 on six targets). CB Jalen Mills has more risk vs. WRs with speed and quickness. Last year Mills was beaten for multiple TDs, which may be a sign of a nice game by Diggs. High priced with a hit or miss skill set. Jarvis Landry (DK – $6,800/FD – $6,900): Landry struggled to get open last week (four catches for 34 yards on ten targets), but he did score his first TD of the year. Jarvis has two games with over 100 yards receiving while averaging 11.5 targets per game. His yards per catch (13.0) continues to rank above his career average (10.3). WRs have 49 catches for 527 yards and five TDs on 89 targets against the Ravens with two WRs having success (Tyler Boyd – 6/91/1 and A.J. Green – 5/69/3). Cleveland should get him in favorable situations by lining up in the slot on most plays leading to Landry drawing Baltimore’s weakest CB. I want to root for Baker Mayfield in his first him start, which points toward Jarvis having success. More of a play from the heart than the head. Corey Davis (DK – $6,400/FD – $6,400): For the first time in his young career, Davis showed his explosive upside against the Eagles. He caught nine of his 15 targets for 161 yards and one TD while gaining over 20 yards on four plays. Overall, Corey has 22 catches for 312 yards and one TD on three targets, which puts him on a path for a special season. The Bills didn’t allow a TD to a Vikings or Packers WR over the last two games. On the year, WRs have 60 catches for 641 yards and four TDs on 92 targets vs. Buffalo with Adam Thielen (14/105) being the only WR with over 100 yards receiving. CB Tre’Devious White tends to minimize the damage in both yards and TDs. I like his direction, but his salary is much higher than I’m willing to pay at DraftKings. Cooper Kupp (DK – $6,300/FD – $6,700): Kupp had the best game of his career in Week 4 (9/162/2 on 11 targets). He now has four TDs on the year with 24 catches for 348 yards in 32 targets. Copper is on pace for 96 catches for 1,396 yards and 16 TDs on 128 targets. His success pushed him to 7th in WR scoring in PPR leagues. Last year he had two short games (3/44 and 2/21) against Seattle while receiving 11 targets. CB Justin Coleman will have his first test of the young season. Kupp grew up in Washington while going to college at Eastern Washington, which means he’ll have plenty of fans and support in the stands. Not quite an elite opportunity as far as targets and his salary is no longer a layup. His scoring ability does keep him in play at this level. Alshon Jeffery (DK – $6,200/FD – $6,800): Jeffery hit the ground running in his first game in 2018. He caught eight of his nine targets for 105 yards and one TD. The Eagles had him on the field for 83 percent of their snaps. After playing well defending WRs over the first three games (8/110/1, 17/161/1, and 8/81/0), the Rams’ WRs beat Minnesota’s secondary for 21 catches for 379 yards and four TDs in 24 targets. Alshon should draw the Vikings’ top CB Xavier Rhodes on most plays. If this game is played at a fast pace, Jeffery will be in the mix at this level. Kenny Golladay (DK – $6,000/FD – $6,300): With each game that passes in 2018, Golladay has seen a drop in opportunity (12, 9, 7, and 4 targets). Over four games, he has 23 catches for 330 yards and two TDs on 32 targets while receiving WR2 targets in Detroit. The Packers hope to have CB Kevin King back in the starting lineup after missing the last two games with a groin injury. Golladay has the tools to have success in this matchup, but he needs a bump in targets. Calvin Ridley (DK – $5,800/FD – $6,800): After being shutout in his first game on the road, Ridley caught 15 of his 19 targets at home for 264 yards and six TDs. The Falcons only had him on the field for 54 percent of their plays last week, which was a season low. Overall, Calvin has been on the field for 59.4 percent of the plays run by Atlanta. CB Joe Haden played well in his three starts this year, but I’ve seen him get beat many times for TDs in Cleveland. Haden tends to stay on the right side of the field while the Falcons will move their WRs around. I’d like to see more playing time, but it’s tough to ignore his TDs in what is expected to be a high scoring game. Ridley is still overpriced for his targets. John Brown (DK – $5,600/FD – $6,200): Brown has a TD in three of his four starts while adding big-play ability to the Ravens’ passing game. Over four games, John has 15 catches for 338 yards and three TDs. He’s caught only 50 percent of his targets (30), which does invite some failure risk in the wrong matchup. Brown has six catches over 20 yards with three of those catches gaining 40+ yards. WRs have 60 catches for 758 yards and five TDs on 105 targets against the Browns. CB Denzel Ward has the wheels to match Brown stride for stride while owning an edge in size. Brown is an avoid for me in Week 5. Amari Cooper (DK – $5,500/FD – $6,500): For the those trying to time Cooper in the season-long games, he made them pay if they bench after a poor game. Amari has two high-level games (10/116 and 8/128/1) while his other two games landed off the fairway (1/9 and 2/17). Overall, he has 21 catches for 270 yards and one TD on 30 targets, which puts him on pace (84/1080/4 on 120 targets) to fall in range with his best two years in the league. WRs have two games of success against the Chargers (KC – 12/206/3 and LAR – 21/265/3) while Buffalo (6/112/1) and San Francisco (11/122/1) didn’t have the talent at QB or WR to test LA in the secondary. Casey Heyward was one of the best cornerbacks in the league in 2017, but he’s made more mistakes this year with the Chargers lacking the pass rush in front of him. If this game gets to be wide open, Cooper is going to get targets while having a favorable salary. Nelson Agholor (DK – $5,300/FD – $6,100): So much for Agholor being a good cover for Alshon Jeffery over the first month of the year. Nelson has 25 catches for 185 yards and one TD on 39 targets, but he’s gaining only 6.7 yards per catch. On the positive side, he did have 12 targets last week even with a poor outing (5/22). His matchup vs. CB Mike Hughes looks to neutral. A decent floor in catches, but Nelson needs to find more free space after the catch or hit on a play downfield. The direction of Carson Wentz gives him a reasonable chance at a 20 point game if he scores. Devin Funchess (DK – $5,200/FD – $6,200): Over the first three games, Funchess has 14 catches for 185 yards and one TD on 19 targets. His best game came in Week 3 (4/67/1) vs. the Bengals. New York has been very good vs. WRs (31/574 and two TDs on 67 targets) in 2018. Their biggest failure came in Week 3 (13/225/1) against the Texans while their best success came last week against New Orleans (7/79 on 13 targets). CB Janoris Jenkins had his biggest struggle in Week 2, but he continues to allow a high competition rate. Based on 20178 stats, Devin looks like a fade, but I’ll give him a chance to surprise in this matchup helped by a low salary. Geronimo Allison (DK – $5,100/FD – $5,700): Last week Allison suffered a concussion, which may lead to him missing this week’s game. He had a season-high 11 targets vs. the Bills, which led to six catches for 80 yards. On the year, Geronimo has 19 catches for 289 yards and two TDs on 29 targets. Lions slot CB Jamal Agnew shouldn’t present a problem, which means that Allison may end up being the Packers’ top WR in Week 4. Need more info, but the second WR in Green Bay is going to be value in this matchup if Randall Cobb sits out again. Michael Crabtree (DK – $5,100/FD – $6,400): The Ravens haven’t got Crabtree rolling this year leading to three mid-level games (3/38/1, 5/56, and 7/61) which works for the season-long games. Last week he caught only three of his eight targets for 29 yards. Michael averages 8.5 targets per game. CB Terrance Mitchell allowed big plays and TDs in 2017 even with a short completion rate against. This season WRs tend to have short yards per catch. Crabtree can have value at the goal line so I can’t write him off at this level. Doug Baldwin (DK – $5,000/FD – $6,700): In his first game back in the starting lineup, Baldwin caught five of his seven targets for 41 yards while being on the field for 76 percent of the plays run by Seattle. WRs have only had 21 catches for 245 yards and two TDs on 36 targets over the first three games vs. the Rams, but the Vikings did beat LA’s secondary for 25 catches for 336 yards and three TDs on 36 targets in Week 4. CB Marcus Peters (not well) ended up playing last week while Aqib Talib landed on the IR after having ankle surgery. CB Nickell Robey-Coleman will allow catches for short yards while minimizing the damage in TDs. I need to see more from Baldwin, but he is priced favorably while Seattle will have to pass to win the game. Keelan Cole (DK – $4,900/FD – $5,700): Cole went from Fantasy gold in Week 2 (7/116/1) to Christmas coal over the last two games (5/40 and 2/15). On the year, Keelan has 17 catches for 225 yards and one TD on 24 targets. His opportunity is going to be inconsistent from week-to-week, but he does have the skill set to produce when given an opportunity. WRs have 60 catches for 626 yards and five TDs on 104 targets against the Chiefs with the Steelers having the most success (24/216/2). Two WRs have over 100 yards against Kansas City (Keenan Allen – 8/108/1 and JuJu Smith-Schuster – 13/212/1). Interesting game if Patrick Mahomes can put points on the scoreboard. I expect better in Week 5. Dede Westbrook (DK – $4,700/FD – $5,900): Westbrook caught four passes over 20 yards last week leading to his best game of the season (9/130 on 13 targets). Dede pushed his season totals to 21 catches for 294 yards and one TD on 112 targets. This week he’ll draw the Chiefs’ best CB on most plays. Westbrook has the wheels turn a short pass into a long TD or beat a defense deep. Moving in the right direction, but the same could have been said for Keelan Cole in Week 2. A favorable matchup with Kansas City allowing almost 30 points per game. Larry Fitzgerald (DK – $4,700/FD – $6,400): ScoutFantasySports had Fitzgerald in the bust column in 2018, and he’s doing his best to live up to him low billing. After a steady game (7/76) in Week 1, Larry has fewer than 30 yards receiving in his last three starts (3/28, 2/9, and 3/28) on 14 combined targets. Despite a lingering hamstring issue. Fitzgerald was on the field for over 90 percent of the Cardinals’ plays over the last two weeks. Last year he had only nine catches for 102 yards and one TD on 16 targets in two games against the 49ers. WRs have 50 catches for 669 yards and five TDs on 90 targets against San Fran. Josh Rosen should get better with more experience, but Larry remains a foggy ride in his game in the city by the bay. On a side note, Fitzgerald played great in both of his game against the 49ers in 2016 (6/81/2 and 12/132). If two plus two equals free, then Larry has that going for him in salary. Tyler Lockett (DK – $4,600/FD – $6,600): Lockett saw his three-game scoring streak end last week. Over four games, Tyler has 17 catches for 249 yards and three TDs on 23 targets while continuing to return kicks. Last year he had five catches for 34 yards on seven targets in two games against the Rams. Lockett should face the Rams’ top CB Marcus Peters who may not be healthy after suffering a calf issue in Week 3. Not ideal, but Russell Wilson will have to work his magic in this game for Seattle to win. Mike Williams (DK – $4,200/FD – $6,300): Game score should have led the Chargers passing a lot last week, but LA had success running the ball (27/126) while focusing on their RBs in the passing game(9/86/2 on 13 targets). Williams was on the field for 68 percent of the plays run by the Chargers, which was in line with the two previous two games. He finished with only one catches for 15 yards on three yards. Over the first three games, Williams caught 11 of his 15 targets for 189 yards and three TDs. CB Gareon Conley will allow some big plays, but he does have talent after Oakland drafted him in the first round in 2017. Scoring ability, but Mike needs more targets to reward Fantasy owners at this level. Donte Moncrief (DK – $4,100/FD – $5,600): Moncrief hit on a 67-yard TD last week leading to a nice outing (5/109/1). Over four games, Donte has 12 catches for 173 yards and two TDs on 22 targets. He’s been on the field for about 75 percent of the plays run by the Jaguars as the WR2. Orlando Scandrick is a league average CB who played above his skill set so far in 2018. Low volume WR with the size to score TDs. Taywan Taylor (DK – $4,000/FD – $5,000): Taylor received a mid-week gift from Rishard Matthews who thought he deserved a better opportunity in 2018. Taylor was on the field for a season-high 63 percent of the snaps run by the Titans, which led to seven catches for 77 yards and nine targets. Over the last three games, 14 catches for 139 yards and one TD on 18 targets. CB Taron Johnson doesn’t have a long resume in the NFL. The Titans’ passing game tends to fall short, which makes Taywan a tougher play in the daily games.